Rather than updating apps individually, Mac users can wield a convenient feature of the App Store that initiates a bulk software update to every app installed from the Mac App Store, all with a single click. This makes the process of installing available software updates for Mac apps a bit easier and quicker, since there’s only a single action you’ll need to perform to start the batch update to apps. If you’re familiar with the process of updating all apps in iOS then you will find this process on the Mac to be similar, as the App Stores are both fairly similar now especially in the most recent versions of iOS and MacOS system software. The bulk app update process can take a while depending on how many apps need updating, how large the app updates are (recall that you can check the size of Mac App Store software updates manually), and how fast the current internet connection is. If you have a lot of updates available, the internet connection is slow, or the available updates are quite large in size, then have some patience as the process completes. After the updating process has completed for all apps, the “Updates” section of the Mac App Store will be left blank, until any apps have updates available again. 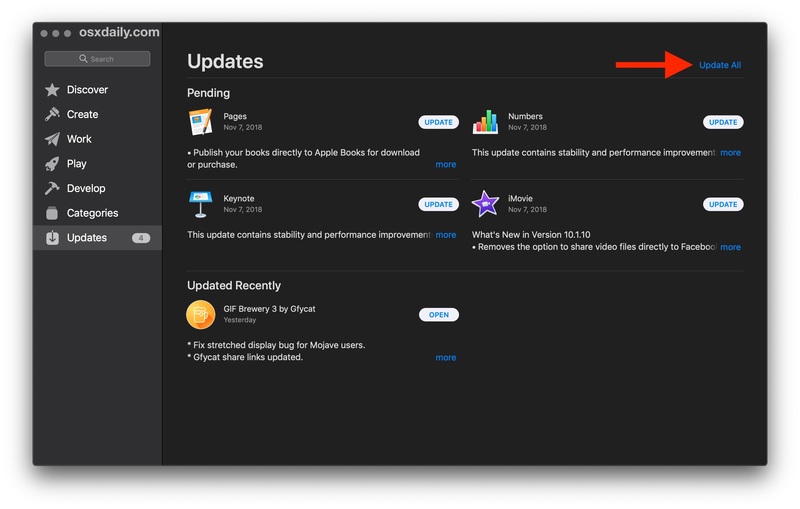 Using “Update All” makes updating Mac apps quite a bit easier, and a bit more automated since you do not have to click each apps Update button. If you’re frequently using this “Update All” function you might want to just enable automatic App Updates for the Mac App Store, a helpful feature in Mac OS that allows a Mac to keep apps up to date entirely on its own. Remember, this will only apply to updating all of the installed apps that came from the Mac App Store, any apps that were installed or downloaded from outside of the App Store will not be updated with this method. Any apps obtained from outside the App Store must be updated manually, usually directly through the app itself (like Chrome, Firefox, Brave, or Opera, for some common examples). I always try and get my apps from the developer. You get more timely updates that way. I’ve noticed apps from Apple’s store sometimes takes quite a while to receive the updates.